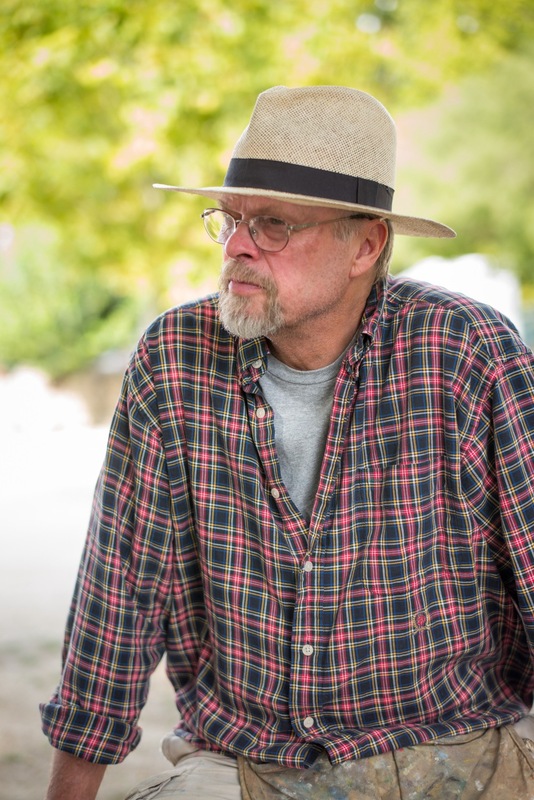 8 day plein-air painting workshop at La Tuilière, Cadenet, (Provence, France). LIMITED TO SIX PEOPLE. Arrive June 5, 2019, paint 6-12, leave the morning of June 13, after breakfast. La Tuilière is a lovely bed and breakfast situated on a 50 acre olive farm and vineyard. It is a beautiful old, classic, Provencal house with wonderful gardens and a pool. The owners, Clotilde and Didier Borgarino, have lovingly restored this house over 20 years, replanted the vineyards and olive groves. The property combines an unbeatable combination of Provencal charm and comfort. Rooms are spacious with all modern conveniences. There is a separate building, the “Orangerie” where breakfast is taken. Breakast is a copious presentation of breads, cereals, fruit, freshly made yogurts and beverages. The Orangerie is also equiped with a fridge and a range allowing for great opportunities to take advantage of the local shops and enjoy picninc lunches or even dinners at La Tuiliere if you do't feel like going to a restaurant. The gardens of La Tuiliere and the immediate surrounding grounds provide innumerable painting sites. The picturesque village of Cadenet is a short walk down the road from La Tuilière. Cadenet is known for its numerous fountains and there are abundant village scenes to paint. The surrounding countryside is mixed agriculture with lavender in the early summer and sun flowers in the late summer and early fall fields of wild poppies in the spring. 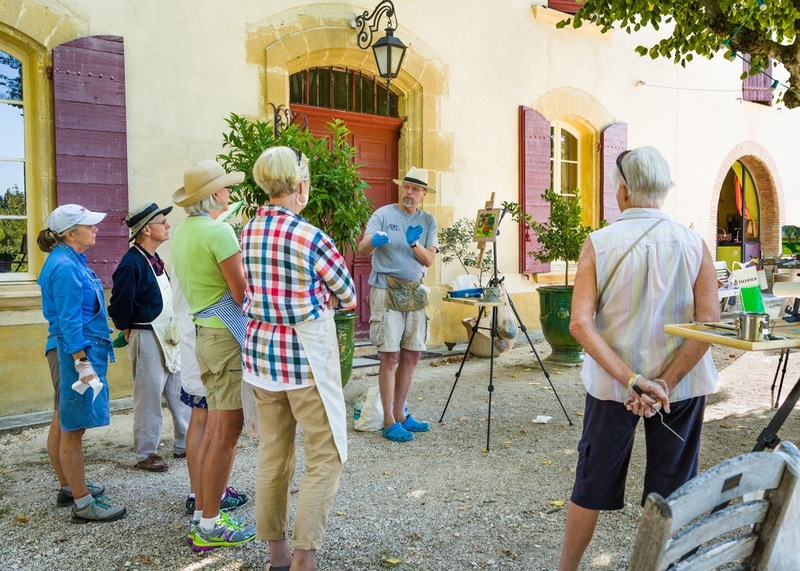 The fee INCLUDES : 8 NIGHTS, 8 BREAKFASTS, 2 DINNERS WITH WINE AT LA TUILIERE, PICK UP AND DROP OFF AT Marseille airport, ALL TRANSPORTATION DURING WORKSHOP AND 2 ALL DAY EXCURSIONS, SOLVENTS FOR PAINTING. DOES NOT INCLUDE: LUNCHES, REMAINING 6 DINNERS, PAINTING SUPPLIES, AIRFARE. NB: The Orangerie at La Tuiliere provides an ideal space for taking meals. Our lunches are typically picnic lunches and they as well as some dinners are taken in the Orangerie after a trip to the market or local stores for excellent regional products. La Tuiliere produces its own very good wines: a red, white, rose and an excellent sweet dessert white , all available at very reasonable prices. There are a limited number of single rooms. Non-participating partners are welcome and the cost of the room is split with that partner plus breakfast. However, I will rent a 7 passenger van for myself and the 6 participants. If you have a non-participating partner who wishes to accompany us on trips to town or elsewhere it is highly recommended that you rent your own car with your partner. You may share a car, as 3 participants did last year, which will give you some extra freedom. If you rent a car I suggest that you make all arrangements before you leave. I usually go with Europcar but all major car rental agencies are available here. Pay with a credit card and you are typically insured through your credit card company. You should double check that with your individual credit card company and get a letter stating that you have insurance. You may or may not need to show that. The car rental in France will try to claim that you have no insurance. Adding insurance here will double the cost of your rental. Automatic shift is not as common here as at home. Gas is quite expensive but the cars generally get much better mileage than ours and the distances are very small. There will be a $400 deposit at the time of registration. Final payment is due 90 days before departure. To sign up or get more information please contact me either by email: brunquist48@gmail.com. or call 207-596-7423. If you call and leave a message please follow up with an email. · 90 days before departure—full refund less a $200 administration fee. These refund policies apply only if we cannot fill your space. If we have a waiting list and can find someone to take your place, you will receive a full refund less the $100 administration cost. I suggest Insurance to cover tour and flight cancellation, baggage loss and any medical cost incurred. This is the responsibility of each participant, and should be purchased at the time of sending in the deposit. Note: the course fee could vary slightly depending on the exchange rate between the euro and the dollar when the balance of the course fee is due in the spring." I will supply odorless turp, purchased in France so there is no need for you to try to transport solvents.. Murphy's oil soap is good for cleaning brushes. Any oil, including even olive oil, can be used to clean yourself. You will not be able to transport solvents on the plane. Your painting can be packed and labled "artist's colors" (not "oil paint" Gamblin has a good site for dealing with traveling with paint. A couple of metal jars for solvent. Even better, a jar with a coil in it (art store or on line). Best is a metal container for solvents with a lid that attaches firmly. Available on line at Utrecht, Jerrys or Blick. Mediums: Any of these are useful. NB: If you are using water soluble oils there are water soluble mediums to be used with them. Disposable palette or, much better a palette box with a lid if your easel does not include a pant mixing area. Bristle: flats, some filbert (#10, #8,#6, #3) and maybe a small round. “Viewcatcher” or two small pieces of cardboard with small windows cut in them of the proportions 4x5 and 3x4 for visually framing what you see. Portable field easel (There are many different kinds available. “Art Box”, “pochad”, or a “Julien” type are some common ones. There are many others. Don’t spend a fortune on an easel until you know what you like. The Julien HALF EASEL is the most economical for what you get but a little too heavy for travel abroad. I use an artbox which I highly recommend (artboxandpanel.com ). They are also fairly easy to make. Check on line for instructions and tips. La Tuiliere in the morning. Bristle: flats, some filbert (#10, #8,#6, #3) and maybe asmall round. Portable field easel (There are many different kinds available. “Art Box”, “pochad”, or a “Julien” type are some common ones. There are many others. Don’t spend a fortune on an easel until you know what you like. The Julien HALF EASEL is the most economical for what you get but a little too heavy for travel abroad. I use an artbox which I highly recommend(artboxandpanel.com ). They are also fairly easy to make. Check on line for instructions and tips.